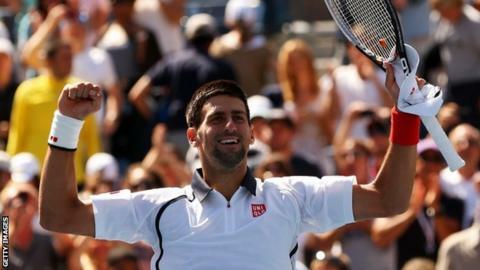 Defending champion Novak Djokovic set up a final with Britain's Andy Murray after a comfortable victory over David Ferrer in the New York sunshine. Djokovic, 25, beat Spain's Ferrer 2-6 6-1 6-4 6-2 in two hours and 32 minutes to reach his fourth US Open final. The second seed returned for the resumption of Saturday's suspended match a rejuvenated man, overpowering the fourth seed from the baseline. Djokovic has now won his last 27 hard court Grand Slam matches. He has still not lost at a hard court Grand Slam since the 2010 US Open. He will play Murray in Monday's rescheduled final at 21:00 BST. Djokovic, bidding for a sixth major title, has beaten the man hoping to become the first male British Grand Slam champion since Fred Perry in 1936 in eight of their previous 14 matches. The Serb convincingly beat the Briton at last year's Australian Open, their only Grand Slam final encounter, although Murray gained revenge by defeating the second seed in this summer's Olympic semi-final. "I don't think there is any clear favourite," said Djokovic of his third consecutive US Open final. "He's looking for his first title, I'm sure he's going to be very motivated. I hope we can come up with the best tennis for this crowd." While British number one Murray was enjoying a day's rest ahead of the delayed final, Djokovic was back on Arthur Ashe Stadium to re-start a match which was suspended on Saturday night after New York City police had issued a severe weather warning. Ferrer was in control before play was halted, but the Spaniard was unable to replicate the form which saw him ease to a 5-1 first-set lead in blustery conditions against an out-of-sorts Djokovic. The 25-year-old five-time Grand Slam winner looked far more comfortable playing under cloudless blue skies, hitting sublime winners and dominating an opponent who was far from his usual warrior-like self. "It's a huge relief to get through this match. David's a great competitor, he's one of the fittest guys on tour and he never gives up," said Djokovic, who is hoping to become the first man to retain the US Open title since Roger Federer in 2008. "We were all praying for less wind. He handled the wind much better than I did but I came in today as a different player and I'm just really happy to get to another Grand Slam final." Ferrer served out for the opening set of the delayed match, but from there on the 30-year-old could do little to halt Djokovic. The Serb secured double break points in the second set to race to a 4-0 lead, although Ferrer did squander three break-back points in the fifth game of the second set before Djokovic levelled the match. Ferrer's backhand was faltering and Djokovic was again in the ascendancy, racing 2-0 ahead and securing the decisive break in the seventh game. Djokovic won the first four games of the fourth set and dabbed a forehand volley beyond Ferrer for an impressive win.